Yogurt drink with L. Casei Danone cultures, vitamins B3, B6, D and ginger. No added sugar - contains naturally occuring sugars. 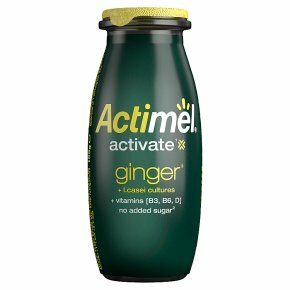 Activate1 Ginger is the warming root used since ancient times in China, which we blend in just the right amount with delicious yogurt containing billions of L.Casei cultures. We also add 1vitamin B3 which helps a normal energy-yielding metabolism. A shot bursting with fresh and fiery flavours to surprise your taste buds. Shake before use. Maximum of 1 serving per day. Ginger3<br>3Not recommended under the age of 10.